A fast and focused final stage for Subaru do Motorsport team in the BOTT Adelaide Hills Rally has produced a hard-earned third place after Heat. The Les Walkden Rallying (LWR) prepared Production Rally Car class All-Wheel Drive WRX STI hit top speeds of 200 km/h+ at many times throughout a brutally fast day. But the Subaru do duo of Molly Taylor and co-driver Malcolm Read maintained fine focus throughout – including the last two demanding 37.37 kilometre Monarto Mega stages, which proved the making of their day. Taylor and Read's rally began sedately last night with two runs around the 1.7 km The Bend Motorsport Park Super Special Stages at Talem Bend, placing them ninth overall. But this morning's efforts, closer to the Mount Barker Service Park, quickly elevated the team to fourth overall, in a Heat dominated by Harry Bates in the Toyota Yaris AP4. Super-fast sixth gear stages defined Heat One of the fifth – and penultimate – round of the 2018 CAMS Australian Rally Championship. Targeting top three contention, Taylor and Read pushed the limits of the WRX STI across today's six stages. With Bates keen to keep in touch with championship leader Eli Evans' Skoda Fabia R5 and Steve Glenney's WRX STI, Subaru do were left to fight for a return to top three placing. The big challenge came this afternoon with two energy-sapping runs through the twin long-distance stages. A mishap for Evans on the first run through SS7 Monarto Mega, gave Taylor the opportunity to pounce. 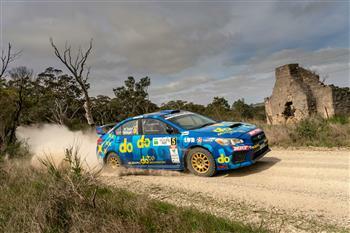 With the Skoda ruled out of the placings owing to nearside damage, Subaru do seized third on stage – and third overall. On her second run through Monarto Mega, Taylor's resolve knocked over 31 seconds off her first attempt – ensuring the top three finish. Molly said: "Sixth gear got a major work-out today. It's been super-fast and grippy in places. "We've has no issues with the car – apart from me looking for a seventh gear at times! "SS7 and 8 were really fun - really slippery, with the car skating across the road at times, but it's a great advert for how robust this Rex is." Tomorrow's Heat Two features a packed schedule of nine stages across 117.31 km. As with Heat One, several new stages, plus others not used for years, add an extra air of excitement and challenge. Podium celebrations due at 5.30pm SA-time. A measured and mature drive on Heat Two of the BOTT Adelaide Hills Rally has produced overall second* place honours for the Subaru do Motorsport team in the South Australian event.